Our major customers from the mining industry are mining round the clock. Technical failures are associated with high costs, since subsequent work processes often have to be stopped. It is thus extremely important to use the best possible wear protection solution. Polyurethane is used, among other things, for scrapers in various conveyor belt cleaning systems or for angle sealing and edge protection. An important aspect of underground mining is safety against explosions caused by electrostatic charges. With these requirements in mind, we work with our PurAntistat formulation, a material with a characteristic profile that ensures the prevention of electrostatic charges. However, we also equip the best-known large machine and the giant par excellence with polyurethane: the brown coal-bucket wheel excavator. The largest of such machines excavates 240,000 tonnes of coal per day. 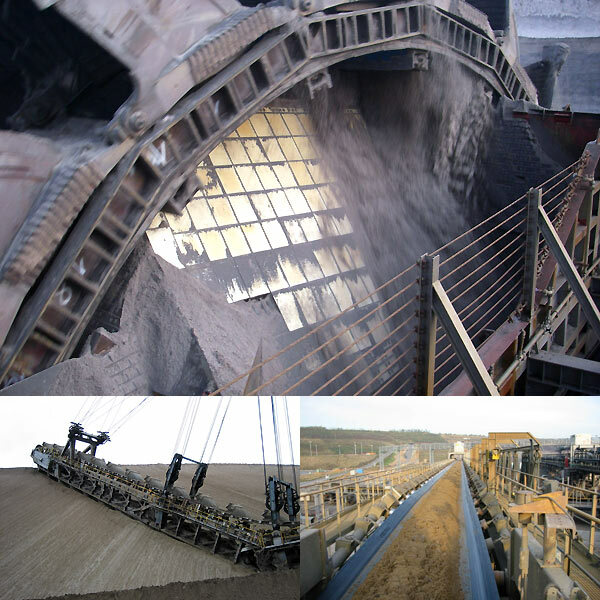 These huge quantities of conveyed material passing through the excavator result in enormous wear potential; also because of the constantly changing rock layers and soil mixtures of varying abrasive properties. The angle seal shown weighs approx. 650 kg and requires a high degree of process reliability in production because of its mass. Two of them at a time ensure that the shaft does not become clogged with the remaining overburden material.